Well, here it is, my first creation for the Christmas season! 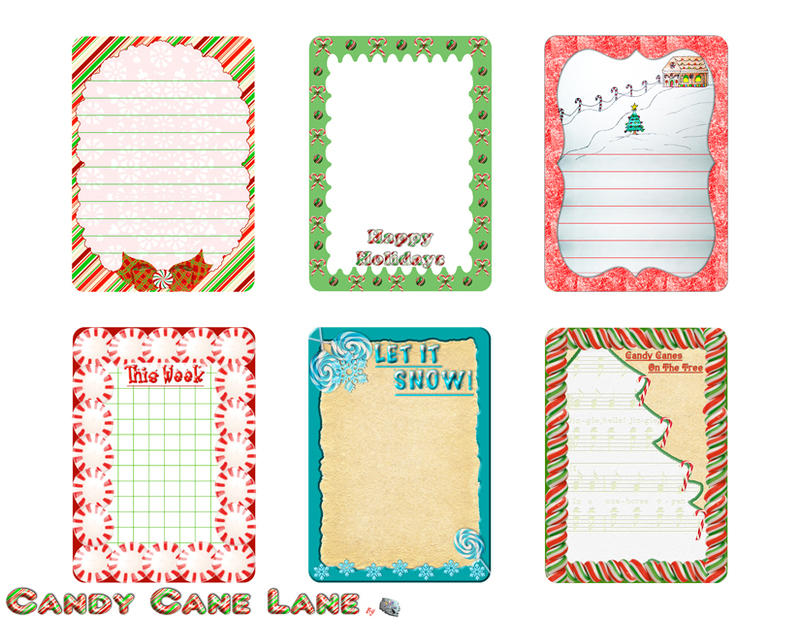 Candy Cane Lane journal cards. I make things like this for both journaling, and because I love to punch holes in them and put in my planner. Of course they are good for so many things, like albums and scrapbooks. They are free for you to print and use for personal use only. Of course, I have a short little quip to tell you about creating these, but if you want to skip the chatter, scroll down for the download. I started making these like a week ago, but my project here has often taken so much time, that it was a crawl to get this done. But I couldn’t wait to make something for the holiday season. I knew I wanted something pretty to put in my planner and see every time I open it up. So I sat down last night to finally polish it off, determined to finish. I threw some Christmas music on to listen to whilst I worked, to get me in the spirit. My beloved had come for one of his bi-monthly visits here for the weekend, to help me get through the stuff, and visit with me, until I can get back home. That alone made my night. So after he fell asleep, I worked on the cards until complete. As I listened to the Christmas music, nostalgia set in, as I reminisced about my childhood with my mother and father and brother. On one hand I felt happy and definitely in the Christmas spirit. Who can’t help but to bop their head side to side when hearing, “Holly Jolly Christmas.” But, on the other hand, there was Elvis. One of his Christmas songs came on, and I got a lump in my throat, and tears formed in my eyes. You see, I have not mentioned it yet, but my father passed away last month…actually it is now one month almost exact. It happened while I was here knee deep in this muck of stuff. (Again see my peace post to get a better idea what I refer to.) My mind sadly wanders to that day last month. Finances are rough for me, but my sweetheart and I scrambled for the funds somehow, and quickly caught a flight down south to visit my father, as I had been told he had been read last rights. The last time I spoke to my Dad, he did not let me in on how serious his condition had progressed. Well, his heart was just about done for. I knew he was on machines, and his heart was weak, but the issues had been ongoing for quite a few years, so it can be hard to tell. It had been much worse than he told me. So, here we were, trying to make it, so I could say goodbye, and well, believe it or not, so my other half could meet him for the first time (we have been together a year now, and I have been unable to afford to see my Dad.) I got ready in the wee hours of the morning, as I prepared for my flight. All the while, I kept pleading, somewhat under my breathe, to anyone or anything in the universe that would hear me…to God, to my dad, to anyone. I asked over and over, for him to hold on long enough for me to get there and tell him how much I loved him, how much he meant to me, and to hug him goodbye. I cried and pleaded. Well, we had just arrived at our mid-point stop across country, readying to get on the next flight, which would land us near my father, when I got the call. My step-mother told me he had died about an hour or so ago. I hung up the phone and cried my eyes out, right in the middle of the airport, as passerby’s looked at me curiously, and quickly. And all my sweetheart could do, was hold me tight, until I had cried every tear I could. I was devastated. No longer would I feel the bear hug of my six foot-five father, no longer would I smell the Captain Black scented pipe fill the room. No longer would I hear that hearty, soul-filled laugh that made everyone around him feel truly good. No longer would I hear those corny jokes. No longer could I look at that warm smile, that as a little girl, made me feel so deeply and completely happy. I can still see myself, running toward the door when Daddy got home from work, and leaping into his arms. And now, after losing my mother over ten years ago, when she was only 54, I have found myself an orphan, losing my other parent at a mere 64. It is a very lonely feeling. So, I sat here last night, and when the opening notes to, “If Every Day Was Just Like Christmas,” by Elvis played, in one sudden moment, I burst into tears. Elvis was my Dad’s thing. He had everything Elvis, he had every song, he saw and met impersonators, and even used to sing Elvis, in uncanny similarity, at mostly family events. Elvis will forever equate to my father, for me. I have not really cried since I left my father’s home state, and the memorial and all. I came right back here and went straight back to work. I suppose I dove in, to ease the pain, or even try to bury it. So, since then, I have not really had much chance or time to grieve. It has been a grueling project. I am under both time and weather constraints. So, as I sat there and listened, the dam really broke open, and I cried for all that I had lost, all the world had lost in such a wonderful man. I looked over to the pipe I took with me from his home, as a memento of my father. It, for now, rests on a shelf under a lamp. As I cried, I picked it up, smelled it deeply, and held it close to my heart, as tears fell down upon it. It, and some photos, an old plaid shirt, and my memories is all I have left of him. It was a very bittersweet and poignant moment. Christmas, to me, has always meant family, love, and togetherness. It has always been akin to Mom and Dad. They made it so beautiful for me. It was a time of innocence and love and closeness, long before so much tragedy and pain struck my life, and sadly, both of theirs too. It was only 8 years of my early life with them, but those years mean the world to me, and I hold them dearly as long as I live. So, now I will face my first Christmas… without both of them. It is a painful idea to grasp. But, as I wiped my eyes, and looked over at my beloved sleeping, I felt grateful, that after so many storms, and all that I had endured, to find a man so unbelievably wonderful, and with whom I share a love, that I know will last a lifetime, and then some. Sometimes, in a lifetime, if you are truly, truly lucky, you find THAT one…and you just know. So, I wiped my face, blew my nose, and smiled as I heard “Frosty” Christmas music play, and went back to work finishing these cards. You see, deep in my heart I know, it’s going to get better from here. Somehow, I believe, my storms are on their way out. So I hold on tight with faith, that not only can I endure this, as I have endured so much already, but I will be okay. If nothing else, I have learned just how strong I am. I know, I can thank my Mom and Dad for that. Well, I just finally finished the journal cards. It feels good to be getting back into graphics and holidays again. I pretty much had given it all up for years, as I weathered my dark days. So, if anything is not up to par yet, forgive me as I am rusty and slowly trying to reacquire my skills, now likely outdated, but that’s what “youtube” tutorial videos are for. 😉 Whatever creativity I have, I can also thank Mom and Dad for that, as they had it in spades, and I am fortunate that they passed it on to me. My mother also spent many an hour with me growing up, teaching me all she knew, and spending a lot of creative time. One of the things that really struck me when I went to visit my father, and only got to make it for his memorial service, was a lovely addition he had made to his kitchen. My father had loved all things Christmas. It was very special to him. He had taken every beautiful Christmas card ever given to him, you know, those scenic Kinkade-like-ones, and adhered them to the front panels of his kitchen cabinets. So instead of the square panels on each door, you saw these beautiful scenes all over his kitchen. I was so grief-stricken at the time, that I did not think to take pictures, but you should have seen it. It was so lovely, and SO my Dad. He did it so beautifully. They all had very lovely scenes. It was truly breathtaking. I did not see this last time I was there, as it was years ago, and they had not been there then. So, when I think of Christmas, I think of Dad so much, even more now. And as I craft these cards, I think of him… and his smiles, laughs, jokes, and big bear hugs float through my mind. I know every time I see a Christmas scene of a log cabin, with pretty lights strung all around, and smoke slowly drifting out of the chimney, I will think of my father. So many warm memories I hold so very tight in my heart right now. Christmas will never be the same without him. Oh, if I could only hear his laugh one more time. Dad, I created these cards while I thought of you, and I dedicate them to you. 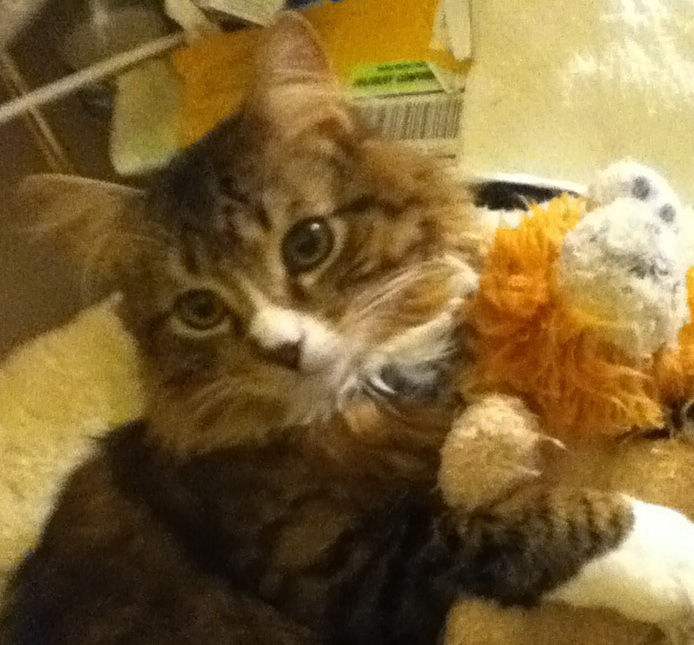 I hope you are in peace, and know somehow, that I always have, and always will, love you with all my being. Goodnight Daddy, I will miss you dearly. So, that is my story for today. And yes, I cried again while typing this. But that is okay. I know the past month I have needed that, and it will help me to move on. I have a wonderful man in my life to share my holidays with, who loves and supports me more than anyone could ever ask for. I know Dad would have loved him. So, I can smile knowing that, and for the love I have shared with my Dad while he was here. You see, that is what makes these cards so special, is the feeling that is behind them. Even if they are not the prettiest or most incredible out there, that is okay, they come from a special place, and for that, I am pleased. =) I hope you enjoy using them, and putting them in with your own memories and stories. I share them with you, so that they may continue to be a part of what makes this season everything good that it is…Love. I am sure I will be making other things for the holiday season, and it is my hope that I can return home in just a couple weeks. So stay tuned, I have lots of other wonderful ideas and goodies in mind for the site, and to share with you. The above is the small size image, and click the link below for the large size.